[SOLVED] What is the terminology for a phrase whose common usage is diametrically opposite to its literal meaning? If the person literally loves fish, he/she wouldn't really want to take its life and eat it. What they really mean to say is I love cutting and eating a fish. Does this come under Irony? But Irony is generally a deliberate attempt to reverse a meaning for creating humor. These could loosely be a type of solecism, but the examples you gave happen to be special cases that don't demonstrate what I think you mean to demonstrate. A better example would be the word "literally." People started using it for emphasis even when it wasn't true, and then it got to the point where it was so overused that people started using it in place of "figuratively," which of course means exactly the opposite. This particular solecism is a linguistic scourge among young women in the US. It is known as a "common error". Another good example is the word inflammable. As in: "Don't worry it says this liquid is inflammable." The common error is that inflammable is not the opposite of flammable, it is the same as. Inflammable is not an error, it's the originally used word. It comes from the same root as inflame, not as an antonym of flammable. The switch to flammable mostly happened in the 20th century, to avoid this sort of confusion. If one word means its opposite, it's called an autantonym or contronym. (from Greek: πολυ-, poly-, "many" and σῆμα, sêma, "sign") is the capacity for a sign (e.g., a word, phrase, etc.) or signs to have multiple related meanings (sememes), i.e., a large semantic field. It is usually regarded as distinct from homonymy, in which the multiple meanings of a word may be unconnected or unrelated. Charles Fillmore and Beryl Atkins’ definition stipulates three elements: (i) the various senses of a polysemous word have a central origin, (ii) the links between these senses form a network, and (iii) understanding the ‘inner’ one contributes to understanding of the ‘outer’ one. Love can be used reasonably and accurately with both versions you give, because language is more than the sum of its parts. Love is much more than one thing, though one word can be used. I love fish. I have raised tropical saltwater fish for 12 years now. I love fish. The light, flaky texture and delicate flavor of (favorite fish here) beats steak any day! Verbal irony is something different. 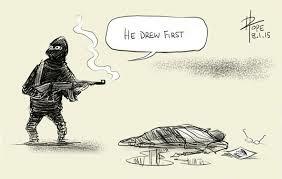 After the Charlie Hebdo attack, verbal irony was everywhere, as in this cartoon. Contronyms ...do not tend to cause confusion, as it is generally clear from their grammatical or semantic context which of their two meanings is intended. In the sentence “He buckled,” for example, we know that the subject collapsed, since in its sense of “to fasten,” the verb is transitive and must be followed by a direct object; similarly, in the two grammatically identical sentences, “The house weathered the storms” and “The storms weathered the house,” simple logic tells us what “weathered” means in each case. Yet there can certainly be instances — e.g., “The horse had a handicap” — in which a contronymic sentence is interpretable in opposite ways. Till a' the seas gang dry, my dear,/And the rocks melt wi' the sun;/And I will luve thee still, my dear,/While the sands o' life shall run. @medica You seem to be suggesting that the polysemy here is present in the word love, but I think that in both cases I love X equates to X gives me pleasure. Isn't the polysemy to be found rather in the word fish (a fish [countable] = an aquatic vertebrate / fish [uncountable] = the flesh of aquatic verterbrates)? There's the same polysemy in chicken, but unlike for fish, the OP's I love chicken doesn't really have two alternative meanings, since the plural of [countable] chicken is chickens with an s.
@LachlanDominic - Nice point. Love (eros, agape, etc) does have different meanings, not all of which mean "give me pleasure" (one hopes, at least). However, is fish polysemy? Maybe! It's a bit like that Twilight Zone when the aliens had that book, How to Serve Man. (It wasn't about selflessness.) There, serve was polysemy. @medica Excellent observation! I stand by my fish [C] vs fish [UC], but I ought to brush up on my Greek before throwing a word like polysemy around with such abandon. the autantonym link is very interesting, especially the examples list. I am realising how weird the word "off" is. [SOLVED] What is the origin and scope of usage for the phrase “how about..”? [SOLVED] What is the use of classical metaphors in literal situations called? [SOLVED] Is "short for words" a common enough phrase? [SOLVED] What is the meaning of the usage 'it ran' in square brackets? [SOLVED] Usage of the phrase "a battery of"
[SOLVED] What does the phrase "lowest common denominator" mean? What is the meaning of the phrase "Signal Advance?" [SOLVED] Is this a correct usage of the phrase "give way"?